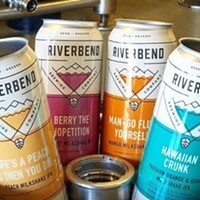 Riverbend Brewing Company is a huge surprise. They've mostly been flying under the radar since they took over the space from Rivals Sports Bar two years ago, but the word of mouth has been consistently positive. The idea behind the place is a fairly brilliant one: Take the customer base left over from the previous sports bar, but hire a damned-good brewer in Kyle Schwenk, and have a real menu with food that doesn't come secondary to the beer. A combination sports bar/brewery is pretty novel. Getting a ton of locals for Ducks, NFL, and college games, while attracting the tourists on the ale trail covers all the bases. It's a recipe for a four-quadrant success as long as the beer and food are good, right? We ordered the beer flight, which came with Schwenk's Classic Pilsner, Bibbidi Bobbidi BOO Pumpkin Ale, Oregonized Love IPA, Katatonic Imperial IPA, Right Said Red, BlackRiver Ale, and Session Blonde IPA German Horse Muffin SMASH. 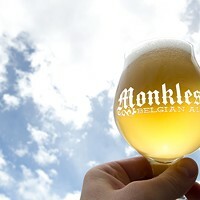 The blonde IPA has heavy citrus notes while having a very mild hop profile. The black ale is extremely clean for a dark beer, with a finish that left the chocolate dangling just a little so you had to go back for more. The Right Said Red is a showstopper­—hoppy, deep, perfectly flavored, with an absolutely flawless finish. The imperial has a gorgeous golden amber shine, a refreshing dry mouthfeel, and delicious flowery notes for an imperial. Oregonized Love IPA is piney and delectable, with a long, luxurious finish that needs a full pint to give up. The pumpkin ale shouts allspice during the nose, while the initial bite is filled with nutmeg, cinnamon, and some ginger, with a finish indistinguishable from a bite of pumpkin pie. Finally, the pilsner: Not flashy, but simple and light for someone looking to drink without losing the plot. The food was ridiculous. A pound of wings (I ate every single one and regret nothing) with excellent Thai chili and sriracha flavoring; ten dollars for a pound of wings is a great price and the fat with meat treats were great. The Barvarian [sic] pretzel was soft and salty with delicious melted Gouda and stone-ground ale mustard on the side. Great starters all around. The main meal consisted of a melted Gorgonzola bacon burger and the fish and chips. The locally-sourced bacon was crisp and thick, the St. Helens beef was perfectly cooked and melted in the mouth. The fish and chips are no frills; simple, delicious, buttery, flaky, and soft with a huge pile of fries as a base. Dessert was a deep fried Twinky. It was so good I thought about ordering another, but common decency told me I should not. 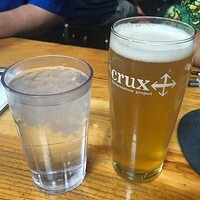 While Bend has a massive number of breweries to choose from, there aren't many that are especially known for their food. Riverbend's food game was strong enough to recommend it even if their beer game was off. Luckily, their 15-brew deep beer menu is on point, with one of the finest reds I have had locally in years. This place has been quietly and simply doing a damned good job for two years without much attention and that deserves to change. Even if a sports bar isn't your scene, Riverbend will abide. 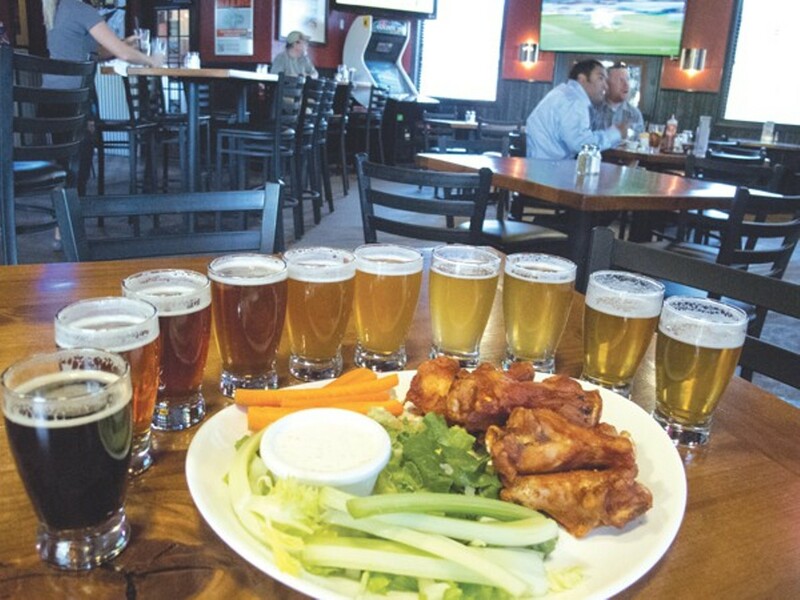 While the place is shoulder-to-shoulder for Ducks games and certain NFL events, the place has a brewery vibe, even with all the sports memorabilia and televisions everywhere. Even the CEO of Riverbend, Gary Sobala, would rather be seen as a brewery than a sports pub. "We're a brewery #1 and a sports bar #2," Sobala says. "We would rather people say, 'Let's go to Riverbend for a beer and maybe there will be a game on,' as opposed to, 'Let's go watch some sports and have a beer.'" With beer and food that good, I'll call them whatever they want.